Hunters took to the field in southwest Montana in great numbers over the opening weekend of the general season for deer and elk. Check stations from around the region had hunters reporting muddy and tough conditions in some places due to rain, and high winds throughout most of the weekend. A total of 3556 hunters were checked by staff and volunteers in Region 3. The busiest check station was the Cameron station in the Madison valley. There, staff and volunteers met with 691 hunters, the highest number of hunters on recent record. Hunter success was below the recent average for elk in the Madison. However, at the Gallatin check station, 16 elk were checked which is above the recent average. Large numbers of hunters were also seen at the Alder, Divide and Silver City (Helena area) check stations. Success varied, but overall harvest was promising across the region, with deer and elk success rates ranging from 5.2 percent at Silver City to 19.4 percent at Livingston. Check stations also saw other species like bighorn sheep, antelope, moose, and one wolf. 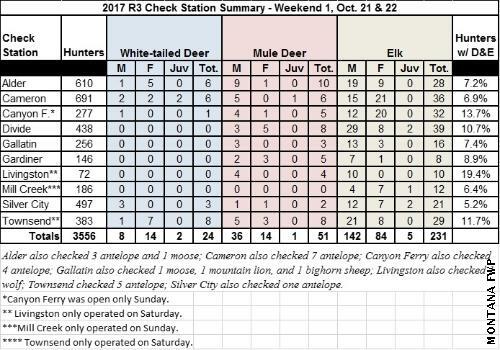 The two check stations in Park County (Livingston and Gardiner) were run this year primarily to gather samples for Chronic Wasting Disease (CWD). They also gathered hunter and harvest data. In fact, this is the first time the Gardiner check station has been open during the general rifle season. It used to only operate during the Gardiner Late Hunt which ended after the 2009 season. Samples were taken from the five mule deer checked in Gardiner as well as the four mule deer that came through the Livingston station to test for CWD. The only documented cases of CWD in Montana were in captive elk at a game farm in Philipsburg in 1999; however, CWD has been detected in free-ranging populations in 21 other states and two Canadian provinces – the closes case being just seven miles from the south-central Montana border in Wyoming. That is why Fish, Wildlife and Parks is ramping up surveillance and prioritizing south-central Montana for sampling.